Deals 150 damage to opposing Pokemon. Heals this creature for 120 HP. Then, fully heal all other Pokemon and revive all knocked out Pokemon and heal them too. Fully heal this creature and confuse, burn, paralyze, and poison the enemy Pokemon, and deal 70 damage to it. 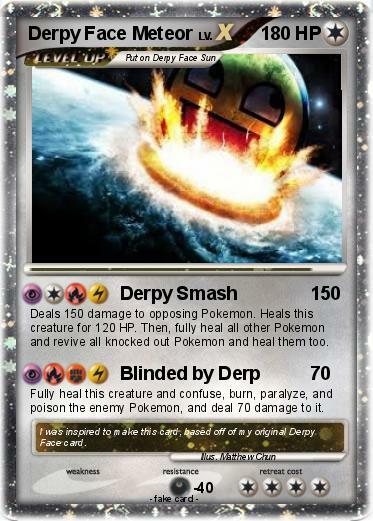 Comments : I was inspired to make this card, based off of my original Derpy Face card.